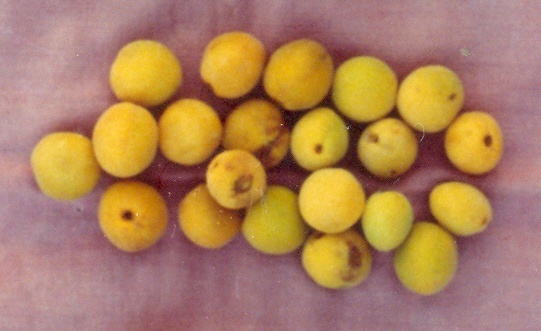 « APRICOT_Prunus armeniaca » CHULLI APRICOT_Prunus spp. Sahra is kind of apricot which found grows wild in the Western Himalayas at an elevation of 800 and 1200 m above the mean sea level. There are two more wild growing apricots in the Himalayas viz. chulli and zardalu besides sarha. Out these, sarha requires least chilling and grows at relatively warmer locations than the other two. Tree spreading, round topped, height 7.32 m, spread 7.08 m, trunk girth 68.62 cm, bark colour reddish brown. Leaves ovate to obovate, apex mucronate, base obtuse, margin finely serrate, intermediate, lamina wavy to twisted, colour of emerging leaves light red, mature leaves green, upper surface glabrous, lower surface pubescent, length 7.52 cm, breadth 5.71 cm, length breadth ratio 1.32, petiole glabrous, colour reddish yellow, length 3.10 cm, glands present, orbicular in shape and tan in colour, 4-5 in number. Flowers white with a tinge of pink, 3.0 cm across,; petals 1.44 cm long and 1.30 cm wide; stamens 33.3, 0.87 cm long; style straight, white with purple tinge, 1.60 cm long. Fruits round with compressed sides, apex depressed with russetted dot, base round, colour yellow, length 2.02 cm, breadth 1.86 cm, weight 9.390 g.
Stone clinging to pulp, shape ovate, surface smooth, length 1.47 cm, breadth 1.33 cm; kenel ovate, 1.08 cm long, 0.87 broad and bitter in taste. Sarha apricot blooms during the first of half of March. The fruits are ready during the second week of May. The fruits contain T.S.S. 10.57%, acids 2.56% and total sugars 4.90%. These are edible but are more sour and inferior in quality than commercial apricots. The wood is hard and is used for making agricultural implements. It is also used as a fuel. Sarha apricot trees grow semi-wild. These are rarely planted. The fruits are also offered for sale sometimes. A detailed comparison of sarha apricot with other wild apricots viz. chulli and zardalu was made by Dr. J.K. Sharma in 1991 at Dr. Y.S. Parmar University of Horticulture and Forestry, Solan, HP, India as a part of his doctoral research. He concluded that sahra was quite distinct from other wild and cultivated apricots. 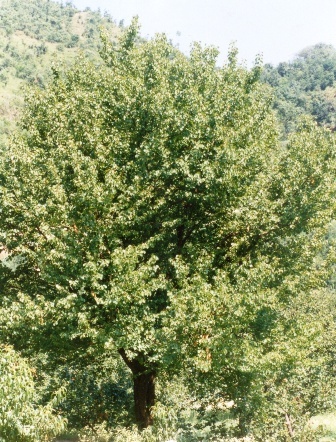 He has recommended that sarha should be designated as a separate botanical variety of Prunus armeniaca.